Back of card: Looks like a the back of a red quilt: A nice red border with diamonds overlaid on squares. Can be inverted. Booklet included: Yes, 37 pages, 2.8 x 4.4 inches, or 70 x 113 mm. Comments: A card packed with the deck says this, "The gentle, graceful imagery Maggie Kneen's Old English Tarot is set against the tapestry of medieval England and inspires a peaceful atmosphere for readings and meditation. Relax your mind and reach back to an era that spurs the imagination. Explore a place where every feeling seems possible." Suits are Swords, Batons, Cups & Coins. Face cards are King, Queen, Knight & Knave. On the pip cards, the swords/batons/cups/coins are much more prominent than the picture that goes with the card. 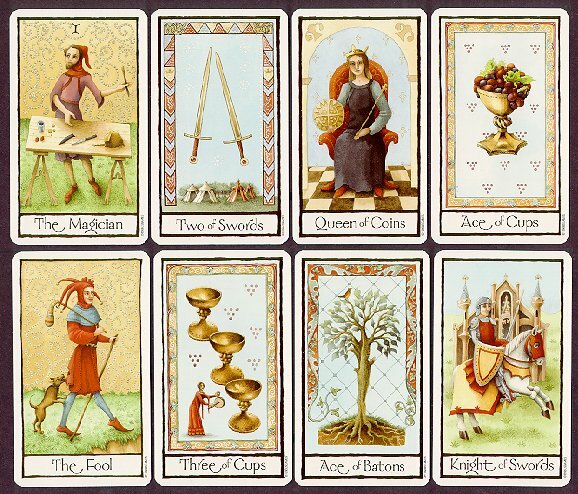 You may also notice a running motif in the background to the cards: Major arcana cards have a fancy scrollwork, Batons have diagonal "window panes", Swords have small white dots against a pale blue sky (too faint to see above), Cups have clusters of grapes, Coins are a simple pale blue. There is, in addition, a consistent border for each suit, as you can see above.